When families come to me sleep deprived and ready for help, they are almost always more concerned with nighttime sleep rather than daytime naps. While naps are likely hard on Mom or Dad, it’s the repeated nighttime waking that can really affect an entire family’s health and well-being. But, the big irony is that nighttime sleep isn’t usually that hard to address. While kids may protest the sleep training process initially, there is so much melatonin in their body at bedtime, and throughout the night, that they generally figure out how to fall asleep, and stay asleep, for overnight sleep fairly quickly. But it’s really naps that can be way more challenging and just as integral for healthy overnight sleep. If your child is younger than 16 weeks of age, I would encourage you to check out my other resources for newborn sleep. If your child is 16 weeks of age or older and you are considering, or already in the process of sleep training for naps, know that there are lots of ways to help your child nap well during the day without endless periods of cry it out. Sleep training at night is fairly straightforward and, depending on the sleep training program you are using, you generally start off the sleep training process at bedtime. Overnight sleep for most infants lasts for about 12 hours, and as your child protests the process of learning to fall asleep on their own, you as a parent know you should continue the process until the morning. But what about during the day? 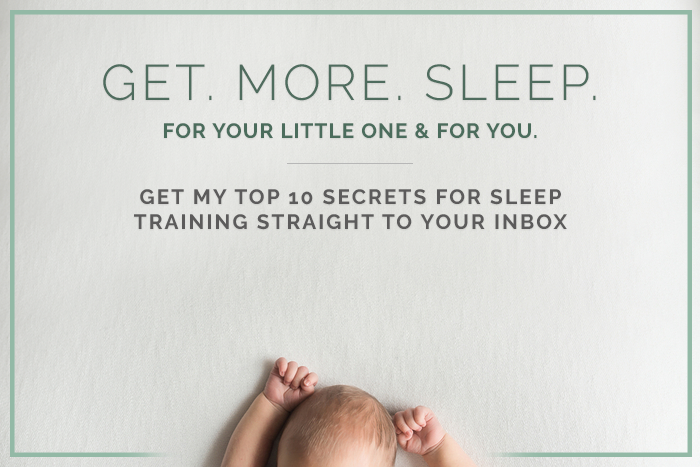 First off, let me state that I never advocate for doing nighttime and daytime sleep training separately. Children need to learn to fall asleep independently at bedtime, but they also need to have the skill of falling asleep at other times (like naps) in order for them to be able to put themselves back to sleep overnight. Babies often struggle severely (read: CRY WAY MORE) during nighttime training if they are still assisted to sleep for naps. So, back to daytime nap training. Sure, you get your baby out of their crib at 7 am and feed them to start their day, and perhaps their first nap is scheduled for 8:30 or 9 am, so you put them down, and now what? Many parents wonder if they should leave their child to cry indefinitely until they fall asleep, or if they should get them up after only 15-20 minutes of protesting. Assuming you have a clear sleep training plan and assuming your pediatrician has given you the full okay to sleep train at night and for naps following said plan, then I would suggest limiting the amount of time you allow your child to try to fall asleep for a nap to about 1 hour. You could do less time, but many, many, many babies need quite a while (especially at first) to learn how to fall asleep for naps. There is a lot less melatonin in the body during the day than there is at night, which means many babies do not feel as relaxed or drowsy (these are the main effects of melatonin on the body) during the day as they do at night. Also, it can get harder for babies to fall asleep for naps as they day goes on. Usually, one hour is enough to result in a child figuring out how to fall asleep on their own. I would not do any sort of nap or night training without following full safe sleep guidelines, and know that in-person checks can often make it harder, not easier for baby to fall asleep for naps. It is imperative to check in if you think something might possibly be wrong, but generally speaking the more hands on parents are during naps, the harder it is for baby to get to sleep for naps. Using a video monitor mounted to a wall or a piece of furniture other than a crib at all times is the only truly safe and advisable way to sleep train for naps and nighttime sleep. If your child falls asleep easily but takes short naps, cry it out may be effective to lengthen their naps. If your child sleeps less than 45 minutes for a nap, you can elect to leave them in their crib for another 10-15 minutes to see if they may fall back to sleep. Some families choose to wait up to a full 30 minutes to see if their child falls back to sleep. In my experience many babies do not usually fall back to sleep when given extra time to cry after a short nap, but, believe it or not remaining in a dark room with white noise (even if crying) can be much more restful than being up with a caretaker, thus making it easier for a child to remain awake happily until their next scheduled nap time. I hope these tips have been helpful in figuring out how to implement cry it out properly during naps, and be sure to check out my book for more detailed instructions on how to properly, and safely, sleep train your baby. What do I do if it’s been 2 hours and he does not sleep? We are doing the cry it out method. Thanks for the tips! If my baby cries for an hour and then refuses to sleep… do I get her out of bed and go about our day as if she’s taken a nap? Thank you! If it’s before 3 or 4 pm, try feeding (while keeping baby alert), and then attempt a nap again about 20-30 mins later. I’ve read your book and we have been night time and nap time sleep training for 3 days now and my baby seems to wake up from naps after only 15 to 20 minutes. She falls asleep within about 5 minutes of crying prior to these naps, but even when left longer in the crib she usually doesn’t fall back asleep and if she does it’s only for another 10 minutes. She is 21 weeks old and her room is dark and we use white noise. She has such a hard time staying up between naps but we’ve been sticking to the schedule in your book. She’s pretty miserable during the day. Any suggestions? This is so common!! Naps will get longer with time, usually closer to 6/7 months, and I wouldn’t be surprised if in a week or two, you were seeing longer naps as well. Truly just keep at it and within 10-14 days I think you may see some improvement. My LO is 6 months and demands to be rocked to sleep. But once in motion, demands to stay up. Once i get him to sleep he will only sleep for 10-20 minutes and doesn’t go back to sleep if left in his crib for extra10 minutes. I co-sleep also and he has good nights! But what should I do about nap time? I’ve tried crying it out/self soothjng but I just feel cruel, plus I live in an apartment building so I feel like people are going to complain as well..
And I’d just give your neighbors a heads up that you’ll be sleep training your baby. When you consistently follow the Baby Sleep Trainer method, there’s often much less crying than you think there will be.